Chilworth Gunpowder Mills Is a scheduled ancient monument. Enhance your visit to the Gunpowder Mills in their magic woodland set by downloading the following information and guided trail. See also a set of images showing the historic remains, shown under Gunpowder Mills Picture Gallery. 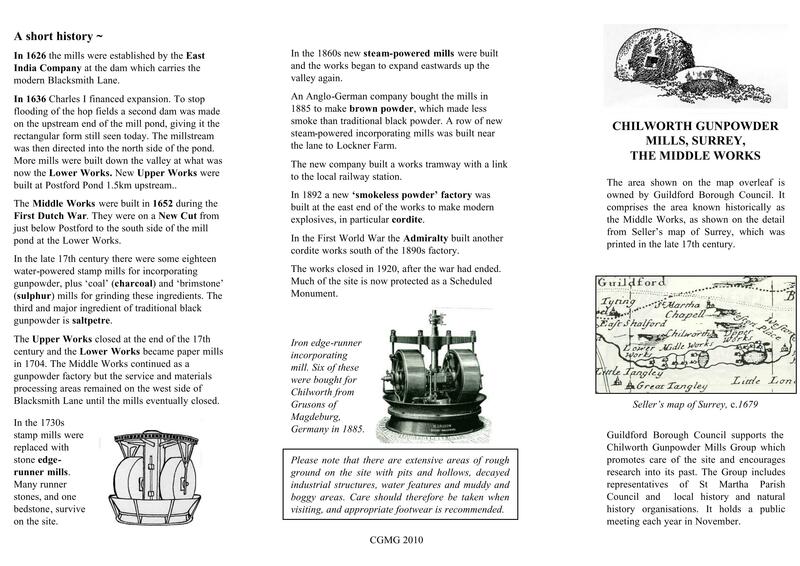 Thanks to Andrew Norris, Chilworth Gunpowder Group for the images, and to Glenys Crocker for permission to download the map. This entry was posted in Activities and Walks, Chilworth Gunpowder Mills Heritage Site and tagged Andrew Norris, Glenys Crocker, Gunpowder Mills, scheduled ancient monument. Bookmark the permalink. Is it possible to pass this along? Hi my name is Sarah Warren and I have an interest in the mill and the chilworth area, as my ancestors lived there. I am related to George Smithers who died in the 1901 accident and would also love to meet any Smithers still in the area and I see you have someone on your team with the surname Smithers. I am planning some visits to the area this year and hopefully doing some Paranormal Investigations and would love to setup a night at the mill to see if we can contact my cousin George or any of the other men who died in the accidents there. my plan is to stay at the Percy arms, as George has been named as the spirit there. 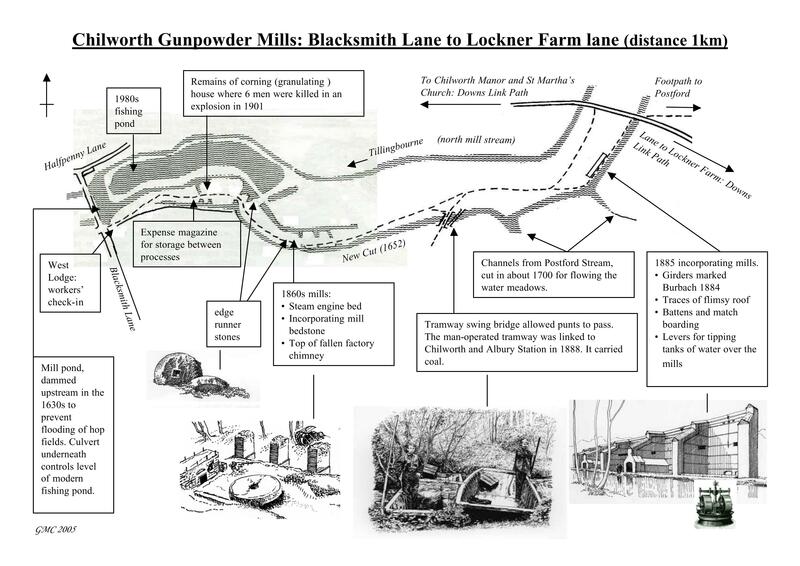 I have other areas of paranormal interest in surrey as well as family historical (my Grandfather was an Edwards) and will be travelling to these areas and blogging and filming along the way, so be great to do a feature on the mill. my email is paraancestry@gmail.com. Disappointed in the fight with West Lodge. I thought that would be turned into a museum for the works. have they not thought about renting as a holiday lodge? if there is anything I can do to help with the fight, let me know. I live in Kent. If I do get access and find some paranormal activity, then there is a revenue that can be created from allowing professional groups in to investigate. something to think about.